In 1946, Bell developed a new general utility helicopter of larger dimensions than the Model 47, as the Model 42, and a military version, the Model 48. The general configuration was a two-blade rotor with stabilising bar, three-wheel non-retractable undercarriage and five-seat cabin with car-like windscreen and doors. The engine was a 540hp Pratt & Whitney R-1340-AN-1 Wasp radial mounted horizontally in the rear fuselage with radiator air intake on top. Alternative equipment included flotation gear for water operation (which was tested on aircraft s/n 46-215), rescue hatch and hoist, litters and life rafts. The USAAF ordered two prototypes of a military derivative, the Model 48, designated XR-12-BE (s/n 46-214/215) as well as a static test airframe. A first production batch of thirty-four examples (R-12A-BE, s/n 47-491/524) was ordered but never built. This order was cancelled in 1947. Meanwhile, the USAAF had ordered a prototype of an enlarged variant, designated XR-12B-BE (s/n 46-216), able to carry up to ten people. This prototype, known as the Model 48A, was followed by a batch of ten similar service trials YR-12B-BE (s/n 46-217/226) with the more powerful 600hp Pratt & Whitney R-1340-5 5 Wasp. 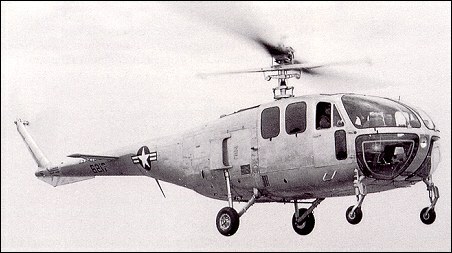 The YH-12B was different in shape and the undercarriage had four wheels (wheel base 3.30m; wheel track 2.13m). The wider cabin had separate doors for the crew and passengers and the nose was nearly all-glazed. Horizontal stabilisers were fitted each side of the tail boom. The anti-torque rotor was now located on the port side of the tail-boom end. At the time, the approximate cost of the YR-12, less government-furnished equipment, was estimated at $175,000. Initial deliveries of the YR-12 were scheduled for the summer of 1946. However, Bell was faced with serious engineering difficulties with the prototype. Serious blade weaving and rotor governor trouble were encountered in the main rotor system. In April 1946, Bell accepted the assistance of the Propeller Laboratory at Wright Field to overcome these problems. In May 1946, the USAAF considered that the YR-12 'was going to require considerable development and time delay before it was a successful ship' and procurement of the heavier Sikorsky S-51 was then considered. Delivery of the first YR-12 was in September 1946. Flight tests went smoothly but no production batches of the H-12 were ordered. In 1948, the Bell Model 48 and 48A were respectively re-designated XH-12-BE, XH-12B-BE and YH-12B-BE. They were used for a variety of test programmes before being withdrawn from use. None of them is known to have survived.